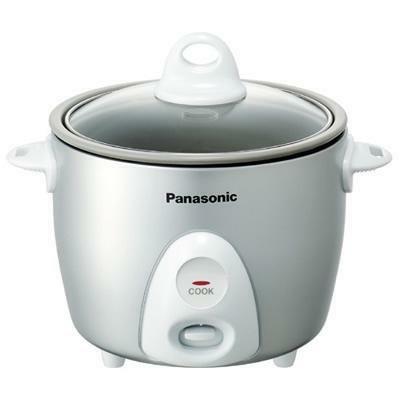 Panasonic automatic rice cooker. This electric rice cooker can prepare up to 6 cups of cooked rice. When cooking is complete, the unit automatically switches to Keep Warm Mode and rice is maintained at the perfect temperature. See-through Tempered Glass Lid allows you to easily and safely monitor cooking progress. 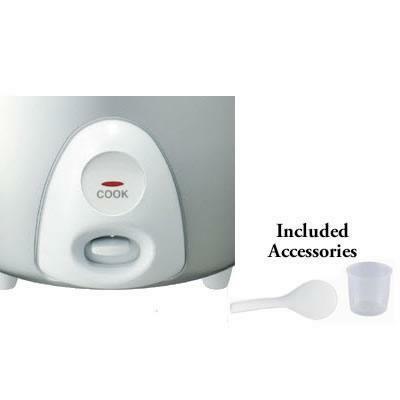 Additional Information -Capacity: 3.3 cups uncooked rice, 6.6 cups cooked rice. -Non-Stick Aluminum Inner Cooking Pan. -When cooking is complete, the unit automatically switches to Keep Warm Mode and rice is maintained at the perfect temperature. -The Cooking light indicates cooking is in progress and automatically extinguishes when cook time is complete. -With just the press of a button, your rice is cooked to perfection. -See-through Tempered Glass Lid allows you to easily and safely monitor cooking progress. -Multi-Lingual Operating Instructions: English, Chinese, Korean, French, Spanish. Included -Rice Scoop. -Measuring Cup.